A corsage is a small bundle of flowers that is pinned to the lapel of a woman's clothing or tied around her wrist. It originates from the French wordbouquet de corsage, meaning a grouping of flowers for the bodice. Taken from the French word for buttonhole, the boutonniere is a small, single flower or the grouping of two or three flowers worn on the lapel of the groom or the other men in the ceremony. Originally, the bridal party receives corsages or boutonnieres. However, there is actually no set of rule about who has to wear them on the wedding day. Family members like parents and siblings, even grandparents have often been given the honor of wearing them. Some couples even provide them for those carrying special tasks like the ushers at the wedding ceremony, for instance. Others choose to provide boutonnieres or corsages for special groups of personal importance, like the bride's sorority sisters. Another option you can consider to spice things up is to have all your guests wear boutonnieres or corsages. You can easily set up a DIY station where guests can create their own boutonnieres and corsages to wear throughout the wedding. Place containers filled with different flowers and other accessories along with some instructions for your guest to create their own corsage or boutonniere. 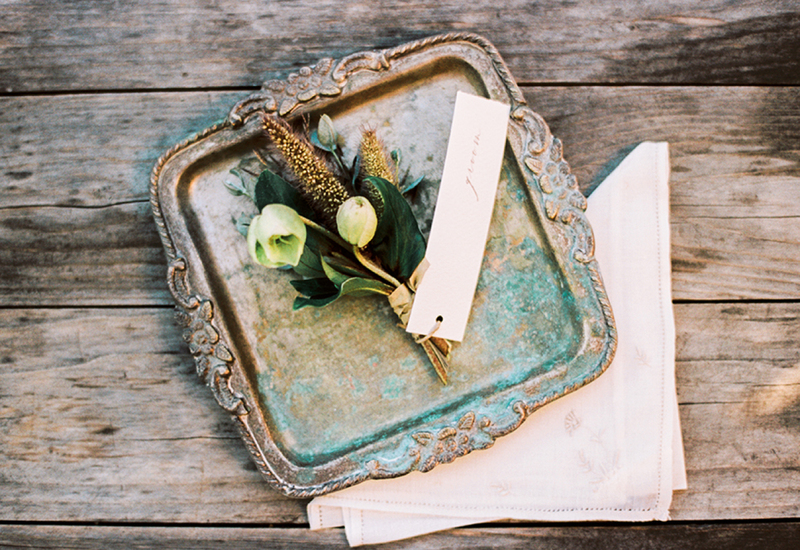 It's a cute way to involve your guests, a great favor idea, and think of all the pretty pictures you will have! Choosing the right flowers as corsages and boutonnieres can be a tough call sometimes. Should you go with a classic flower or something more exotic? Should you choose the same flowers for your corsage and bouquet? Take a look at these dos and don'ts to help you make the right decision. One always has a favorite bloom she wishes to have on her wedding day. If the decision is entirely up to you, go with your favorite bloom as it is a once-in-a-lifetime moment, after all. If you have budget concerns, however, try to stick with flowers that are in season, as importing out-of-season flowers will add a big chunk to your flower expenses. For consistency reasons, it's great if you can get all matching flowers for the bouquet, boutonnieres, as well as the corsages. But if you can't, don't stress over it. The distinctive flowers can create a unique variation as well. The key is to color coordinate them. So even if the flowers are not one kind, the colors will still look harmonious together. First, it's best that your order these corsages at least two weeks to a month in advance so the florist can gather the specific flowers you have requested, especially if they're not in season. 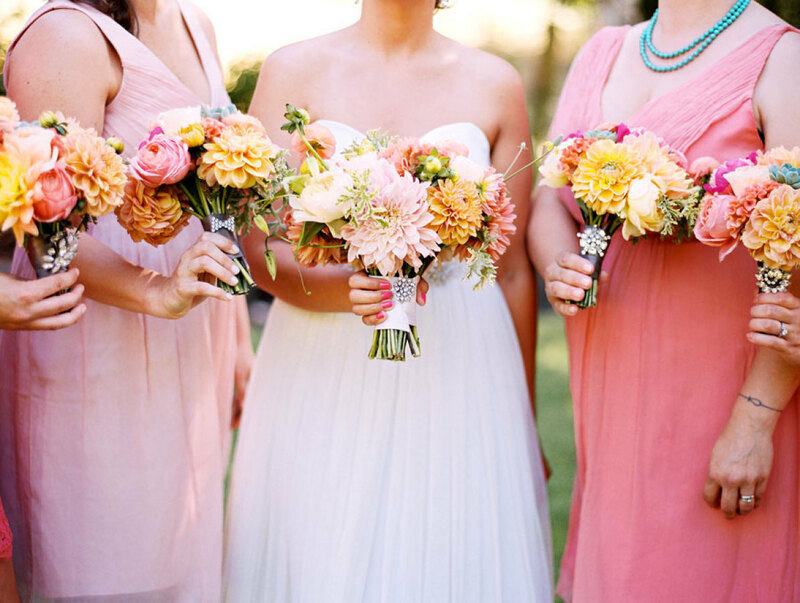 Second, talk to your florist about your flower of choice and the attire your groom and yourself will be wearing. 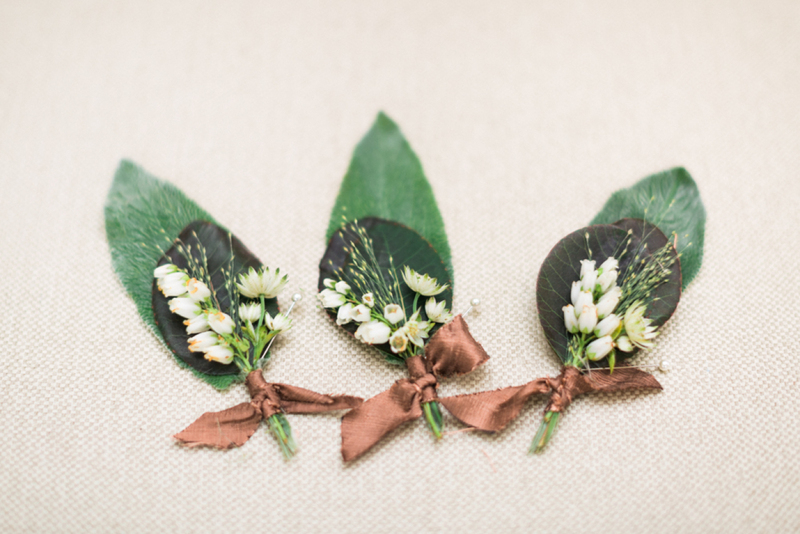 This way, the boutonnieres will be made to complement your outfits, not compete with them. Last but not least, don't be afraid to discuss your budget with your florist. Find a compromise between your budget and your expectations and have an honest discussion with your vendor. After the wedding has ended, don't throw those delicate blossoms away too soon. There are some ways you can preserve them beautifully as a keepsake for you to remember for years. You can freeze the flowers by simply placing them in a container and sticking them in the freezer. Results may vary, as some flowers freeze better than others. The second method is done by using a hairspray. Hold the flowers upright and spray them with aerosol. Again, results may vary because the flowers may shrink. A mix of cornmeal and borax or some dose of silica can also be used to preserve your flowers. The easiest way to do it, though, is to hang each flower by the stem in a warm, dry, and dark place. Voila! How do you keep flowers fresh before the wedding? Keeping your flowers pretty and fresh for your wedding day is a task one can overlook. But you don't want to have your bespoke corsages and boutonnieres wilting and falling apart on the big day, don't you? Follow these simple steps to make sure your flowers will stay fresh and sleek for the wedding day. It's best to have your flowers delivered one or two days before the wedding, so you don't have to have them in your possession for too long. Coordinate with your florist for the best delivery schedule. However, you must order them in advance to ensure the availability of both the flowers and the florist. To keep your flowers fresh, spray the end of the stems with cool water to keep the blossoms open. When you're about to wear them, spray a flower sealant lightly over the blooms and stems. This will ensure the flowers will be protected until the wedding day. If the flowers will be in your possession for one night, refrigerate them. Don't just carelessly stick them into the freezer, though. Pick a spot in which the flowers won't get crushed by other food. Also, do not put them in the freezer, as they might freeze and look horrid once you take them out. Find a place on the shelves near the door and avoid refrigerating them for over 24 hours, as some food might release gases that will contaminate the blooms. The easiest tip? Order hardy flowers in the first place. Hardy flowers are strong blooms which can withstand various temperatures and conditions without wilting or looking worse to wear. Some hardy flowers include roses, orchids, chrysanthemums, and baby's breath. Make sure to ask your florist for other hardy blooms to recommend based on their experience. How do you wear a corsage? 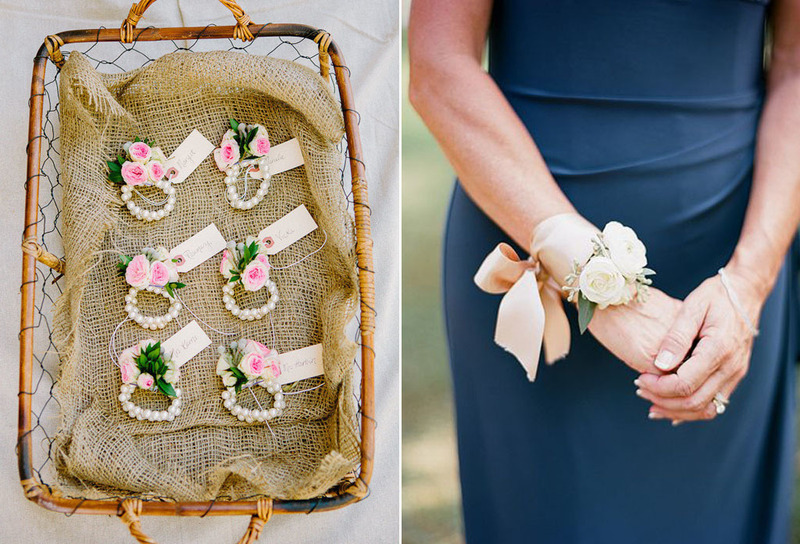 There are a few ways you can wear your corsage, and it can be confusing to choose only one. Remember that there is no right or wrong, and it all goes back to the outfit you will wear and your personal preferences. 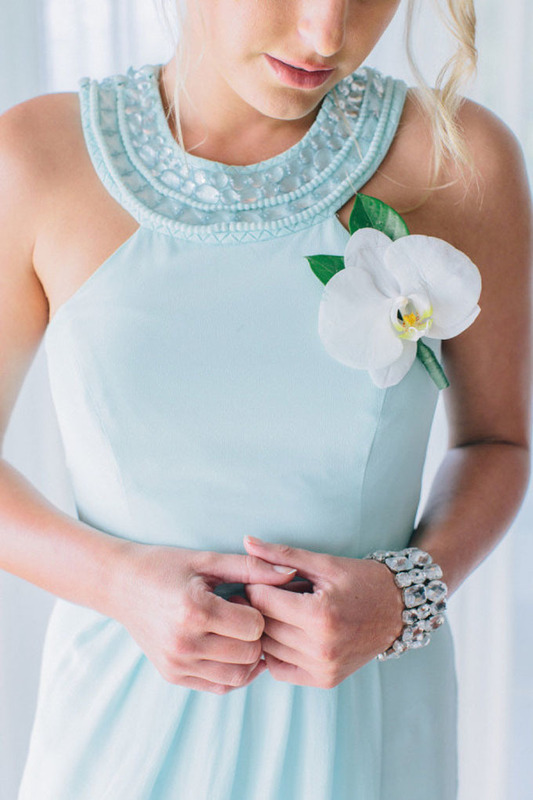 Here are some ways you can choose to wear your flowers. Corsages that are pinned are usually worn on dresses with sleeves. One thing that you should also consider is the material of the dress. If you or your bridal party will be wearing something delicate and soft, like lightweight silk or lace, be careful to not use too heavy flowers so that they won't damage the fabric. Others whose outfits do not accommodate a chest corsage can opt to wear flowers on their cuff. Some have it delicate with only a single flower, some others have it merrier. No matter which look you like, a wrist placement looks sweet and unbelievably dainty. Another way to bring your flowers with you is by holding them in your hands. 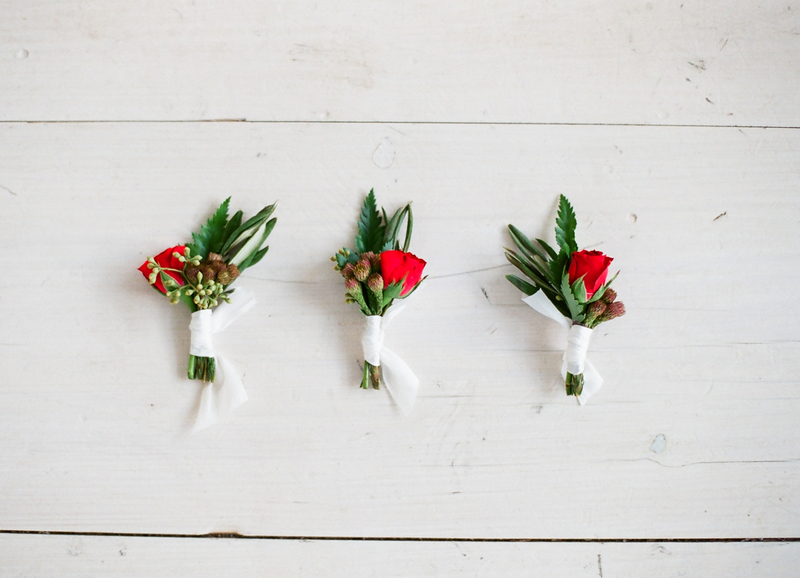 The mini bouquet, also known as a posy, is a very popular option for bridesmaids at the moment. It looks beautiful, and is more versatile for bridesmaids as it doesn't meddle with their mobility in any way. Having shown you a lot of beautiful floral corsages and boutonnieres, we think it might be a great idea to bring forth some non-floral boutonniere options that you can consider for your wedding day. The great thing about non-floral pieces is their versatility and the fact that you can truly customize them to a personal level. Here are some ideas that we truly love. See one you like below? Let us know in the comment section which one it is! Aren’t these metallic beauties charming? 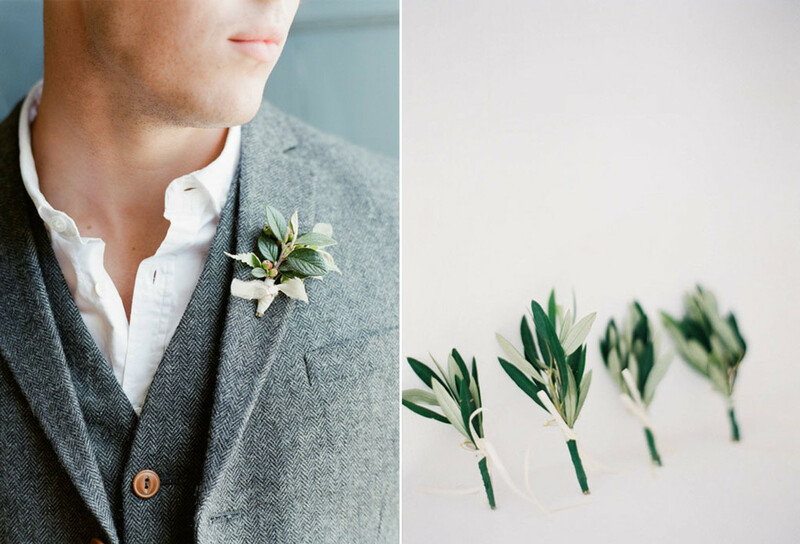 If you're not a fan of traditional floral boutonnieres, these modern ones can be an option especially if you’re looking for something edgy and distinctive for your wedding day. These ones are shaped like feathers, yet you can have them shaped into other pretty things like stars, animals, or even flowers. 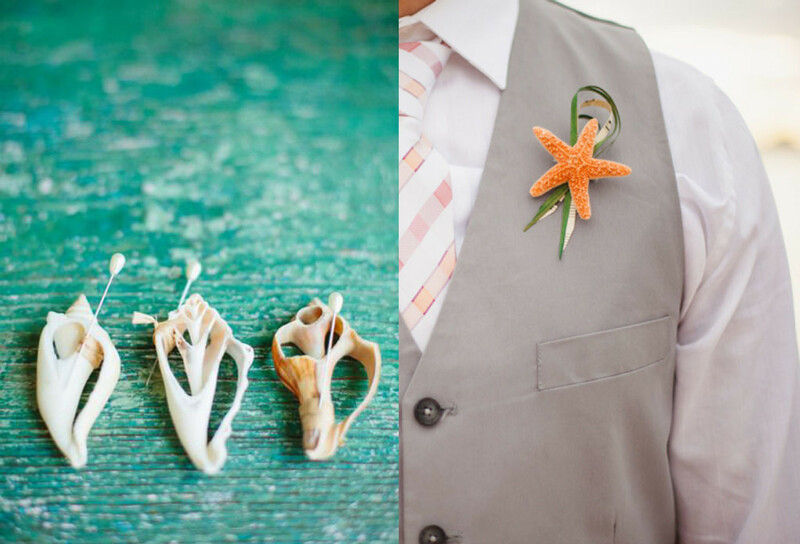 For those planning beachside or nautical-themed weddings, have you ever considered using these oceanic elements as your boutonnieres? They will fit your theme perfectly, and think of all the combinations you can create with starfish and shells. Not to mention the pretty colors on them too! Succulent lovers will love this idea so very much. 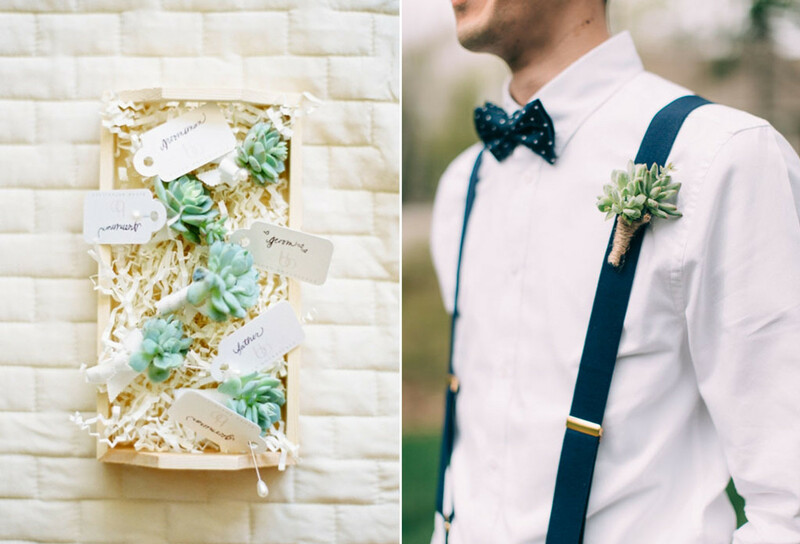 Having succulents as boutonnieres will be perfect to complement a rustic wedding. 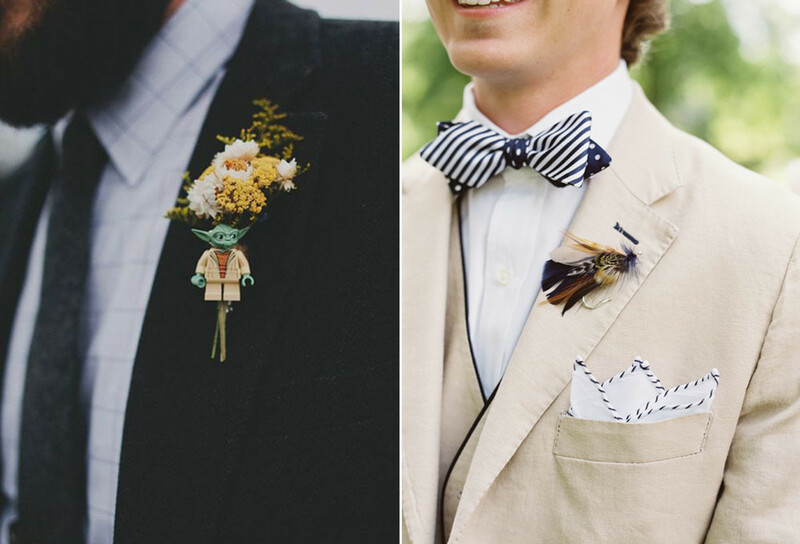 Brides may think that succulents on boutonnieres might be too overwhelming to be worn on the lapel. In that case, you can use baby succulents for a delicate and dainty finish while still having that rugged edge. Refreshing leaves and other greenery are really taking over the wedding world by storm and they have also graciously covered the boutonnieres and corsages. Suitable for organic, simple, and preferably outdoor weddings, boutonnieres made with greenery look so natural with a simple kind of beauty. 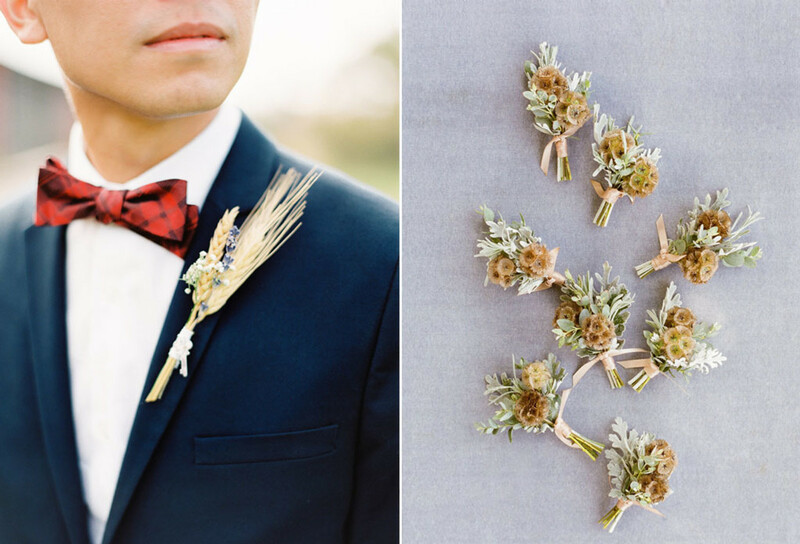 Wheat, leaves, twigs and desert flowers make pretty boutonnieres too! The one on the left cleverly uses wheat stems to be incorporated into the boutonniere and create one that looks like one we would find in a ranch or farm wedding do you agree? 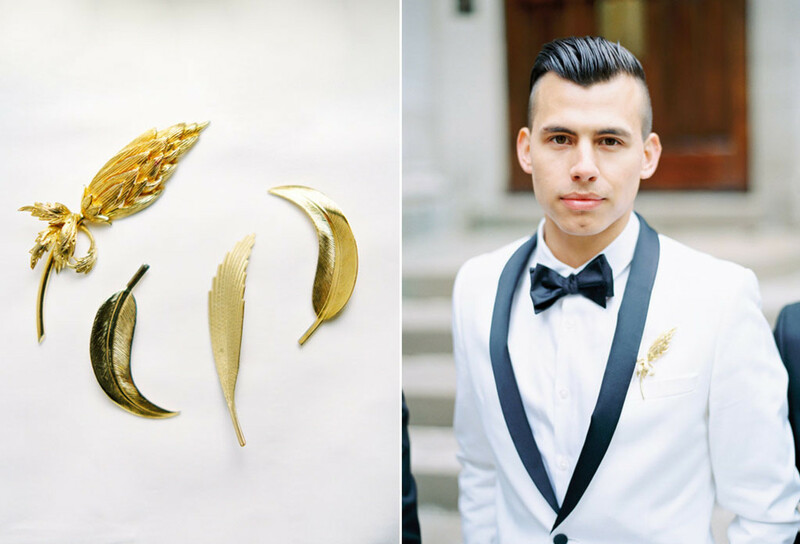 Basically, you can use anything you want to create a completely personalized boutonniere. Card decks, Lego blocks, personal childhood toys, clay feathers, even fishing hooks! 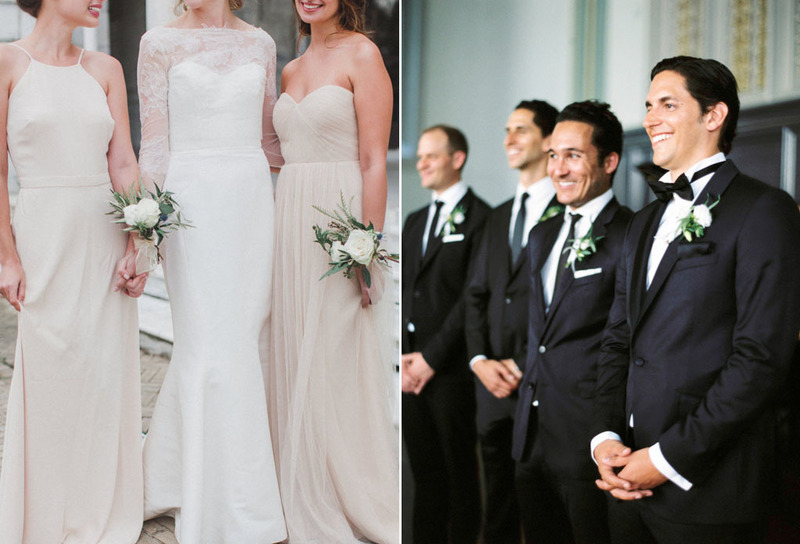 Choose the one that perfectly fits the groom's personality, and your wedding theme of course. This way, the piece will be a bespoke creation to match the wearer and would be a token your groomsmen will appreciate for a long time.